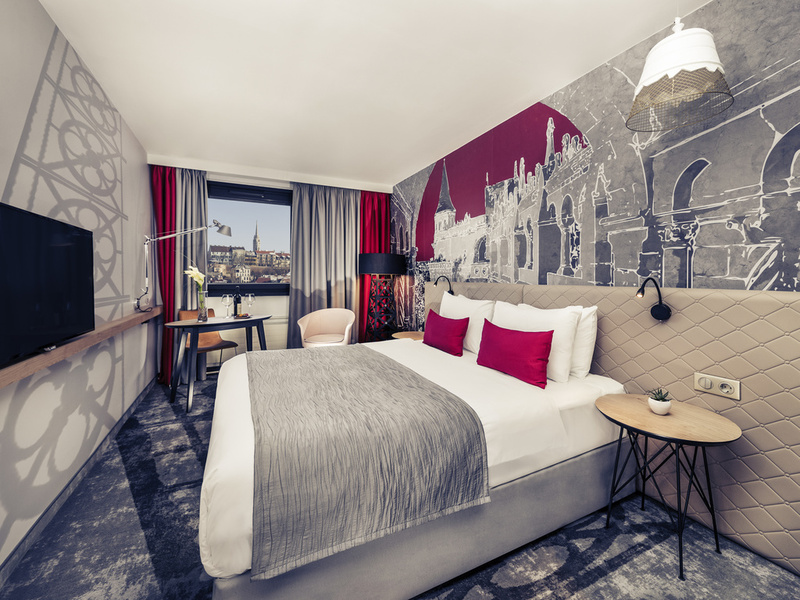 Hotel Mercure Budapest Buda is located in the neighbourhood of the historical Castle District. Walking and shopping district of the city can be reached in some minutes. Choose from different categories available. Standard room offers you a very comfortable stay, Privlege room benefite from a wide range of additional services. Our Budavár Restaurant invites you to sample the very best in F&B. Choose from a range of traditional and international dishes or light meals. We offer fresh and high quality food and beverage with excellent service by a friendly team. Hotel Mercure Budapest Buda's LOBBY BAR in the city center welcomes every guest, offers local and international drinks, cocktails and a wide range of coffee ,tea and beer specialities, light meals. Internet(WIFI) connection. Opening hours: 08h-24h. Everything was OK. I only found it strange to have to call reception if I want to wide open the window, but I guess there must be some reason for that. The ongoing renovation was handled well by the hotel staff. My only issue was that my room upon arrival was very warm, uncomfortably so. I could turn on fan but air conditioning system was not operating. Next morning I heard from a fellow guest that I could request the unlocking of my window to allow greater airflow (I had opened to tilt back but did not help with airflow the previous night). I signed some kind of form, it wasn't clear what I was agreeing to and widow was unlocked....that made a wonderful difference. A note in the room explaining the opening of the window guideline would have improved my first night's sleep. I had a nice stay at the hotel. The staff was very helpful and friendly, especially Ali from the reception. Breakfast was tasty and the room was good. The only thing I struggled with was the air conditioning. It was very hot in the room and I couldn’t really get it to the right temperature. The hotel and staff are nice enough, but they were unable to help with the room temperature, (other than unlocking the window so it could fully open). Overnight, it was around 8C outside but felt like 25 C inside. The staff acknowledged that lot's of people have complained about this, but they had no control over the settings of the central air. It can either be set for heat or cool, not both and since we were still in a time of year it might reach 5 C or less at night, the cooling feature was off. That's a bit ridiculous for a major hotel chain. If you have a situation where many customers complain about the temperature, then you need to address this issue. Everything else about your hotel is fine, but this is the kind of thing that would lead me to book elsewhere. Venue satisfactory, rooms very hot. Venue was satisfactory, work is underway to improve standard of the accommodation. Rooms were too hot, the air conditioning was not working. Temperature of the rooms impacted guests ability to get a good nights sleep. I am pleased that you are investing in the hotel assets by upgrading the rooms. I was pleased to be booked in one of the newly renovated room so it was clean and new. The new decor was nice. The room temperature was extremely warm. The air conditioning was not yet turned on and the window only tilted open. I greatly appreciated that you staff allowed me to sign a waiver so that I could fully open the window to get air. Without this, the room was unbearable to sleep in. I enjoy the castle proximity and the staff was very supportive. The room was overheated and I don't really enjoy the designer's vision; the room seems dark due to the selected colors and due to the small window. I enjoyed the tea availability in the room. The bed was also comfortable. The hotel was lovely and as were the staff. Lovely touches were made by putting balloons and champagne in our room for our birthday. However the air conditioning did not work and the construction was very noisy. Nice upgraded rooms since my last stay, construction was well managed, however the room was very hot and the ac didn’t work after discussing with other colleagues they had the same experience. It was great to stay at Buda side . Very convenient near the tram stop. it was in calm area . Easy to go into city . we enjoyed it. During our stay renovation was going on which caused some problem but not serious.The restaurant can be improved to have more food variety. Front desk people were very helpful. First surprise for me was that I did not know it´s under reconstruction, overall reception and restaurant were only temporary. Parking place I had to use garage which did not belong to hotel + even though I was living in 7th floor which supposed to be &quot;better&quot;, actually it was smelly and already old fashioned. On the other side, staff were really kind. Stay was realky good. The staff was very humble, polite and helpful. Especially Peter.